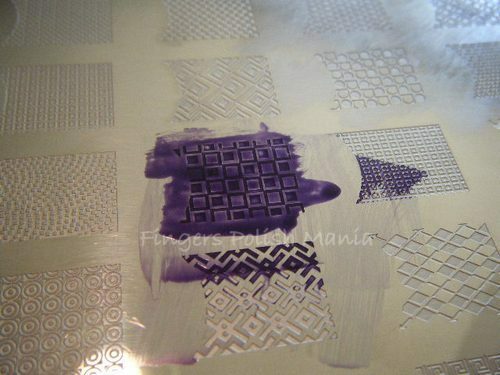 Today I am going to show you my stamping methods. These are steps I use to do my nails. I had to fake some of it since I had no one to help me take pictures! First up, we have my supplies that I use. 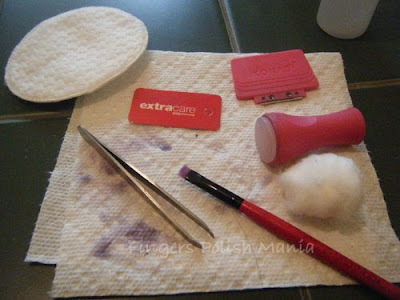 I use the tweezers and cotton ball to clean off the plate in between stamps so I don't mess my nails up. The stamper and the scraper come as a set. I use an old CVS member card to scrape with. I find that the metal scraper leaves scratches on my plates and I don't like that! The cotton pad I place under my plate to catch the excess polish. The brush is for clean up. The first step is to spread polish on the design you are going to use. It should look like this. Next you scrape off the excess polish. It should look like this. I use regular polish. 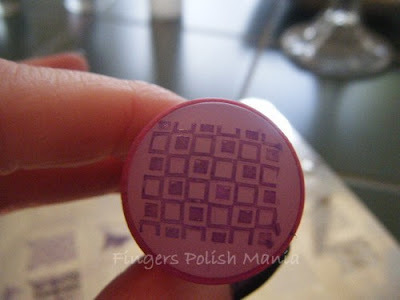 Next you press the stamper on the polish and your stamper pad should look like this. If the design did not transfer in totality, you waited too long and need to try again. The key is to not waste time between steps. This is the part that takes practice! For me, to get the design centered and the same on all nails, I start the stamper on the side of my nail with the design lined up on the edge of my nail and roll it on. It will sort of look like this. To freehand my funky french, I hold the brush at an angle to my nail and move my hand not the brush to get a nice curved line. Like this. I hope this helps you take the mystery out of stamping. Just don't get better than I am!! HAHAHA!